"My son Dylan has been going to camp ever since starting school and still looks forward to attending every time. He has made life long friends in a fantastic environment, with brilliant staff. I never hesitate to recommend AJB Camps whenever fellow parents ask me what I do for childcare during the holidays"
Here at AJB Sports in Education we specialize in Holiday Camps. With over 12 years high quality experience in running camps for multiple age groups and across multiple sports, we are confident that we provide the best and most complete Holiday Camp experience. You can also be safe in the knowledge that all of our football and multi-sports camps are fully Ofsted approved and organised to the very highest of standards. 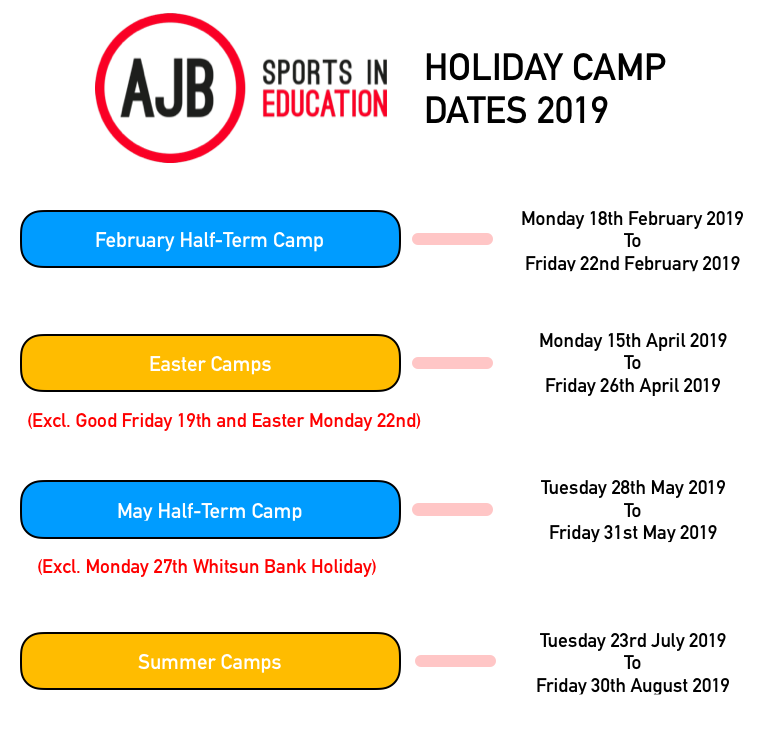 AJB Sports in Education is also acutely aware of the need to feel confident and comfortable in sending your loved ones to camp. This is why we can guarantee that each coach is fully qualified, highly experienced and holds a recent DBS certificate. Our venues are all checked daily for safety and we have thorough and robust policies and procedures in place to cover all eventualities and possibilities. Along with the dedicated and caring nature of our staff, you can feel confident that your children are being cared for in the safest environment possible. Whether your child is really sporty or just wants an opportunity to try new things, our camps have plenty to offer. Our aim is to introduce sports in a fun, friendly and exciting way that everyone can engage with and enjoy in their own unique way. Please check out our Football Camps and Multi Sports Camps pages to help you decide which one is perfect for the upcoming school break. Plus, check out the link below for further pre-camp information to really get you prepped and ready for your child’s big day at camp and to help them make the most of every minute with us!